No BlackBerry Desktop Manager for Linux? Check out LinBerry! Are you a Linux user frustrated by the lack of support for BlackBerry Desktop Manager for your computer? You're definitely not alone. It's a long standing complaint that while Research In Motion has provided desktop clients for Windows and Mac users, they haven't made one available for Linux users. Not surprisingly, this leaves a lot of people struggling to find an alternative for backing up their BlackBerry, whether that means using a different computer or adding a Windows partition to their Linux set-up. 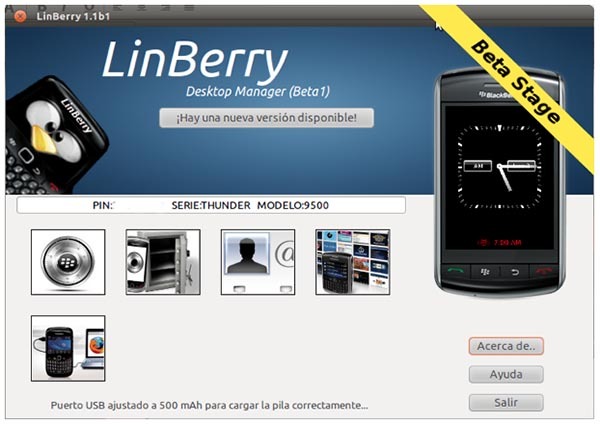 One developer decided to try solving this problem and has come up with LinBerry Desktop Manager. Though still in beta, you can download it to your computer and perform many of the tasks that you would normally do with BlackBerry Desktop Manager on your Windows or Mac computer. With LinBerry you can perform backups, manage contacts, manage applications, and use your BlackBerry as a modem for connecting to the internet. What is expected in future versions? Upgrade the OS of the device. Make Wipe (memory reset) device. Sync with Evolution and / or Thuntherbird Ligthning. Multilingual support beginning with the English language. LinBerry was first released as an Alpha build back in 2010, but has since moved into Beta. While it is expected to work with all BlackBerry devices, it has only been tested on the Curve 8310, Curve 8520, Curve 8900, Bold 9000, and Bold 9650. If you're a Linux user and looking for an alternative to the nonexistent BlackBerry Desktop Manager for your OS, you may want to look into LinBerry as a solution. Let us know in the comments how it works for you!